Last summer, I spent seven weeks in North Lawndale, a neighborhood of Chicago with a reputation for gang violence, poverty, STDs, obesity, and limited access to health care. 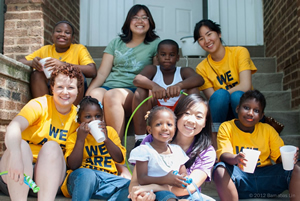 I immersed myself among the urban poor to learn from them as part of the Chicago Urban Program by InterVarsity. As a nursing student, I also interned with Lawndale Christian Health Center (LCHC). At LCHC, I shadowed clinic nurses and saw patients with different backgrounds and stories. I worked in human resources and participated in research projects alongside physicians to survey current demographics of the community. I even worked with medical records staff and grant writers to learn how LCHC functioned to provide quality, affordable healthcare in one of our country’s most underserved communities. Being new to the neighborhood, our team did not know what to expect. Will we be safe? Gang violence was at its peak in the summer and the weather was ridiculously dry and hot. “Just stay indoors after 9:00pm and you should be good,” our neighbors told us. Where could we buy fresh produce around Lawndale? “Pete’s is the best we got but its 20 minutes away by bus,” they said. This level of brokenness in the community defined health disparities at a whole new level for me. My experiences this summer went beyond the patient-client skills I gained through LCHC or learning how to develop trust in a patient-client relationship in a clinical setting when teaching them about their health. I heard stories I never heard growing up in my neighborhood. As an Asian American, the neighborhood of Lawndale taught me valuable cultural-sensitivity skills to prepare me as an effective nurse for diverse patients. Through it all, God opened my eyes and expanded my vision of His kingdom on earth and I saw how much He desired to heal the sick. I learned of a broken system that existed for low-income families that face limited education, discrimination, poor eating habits, food deserts, gang violence, poor management of chronic conditions and increasing STD rates. All this contributes to a vicious cycle in underserved communities such as Lawndale in the city of Chicago. Through our program’s multi-ethnic workshops and neighborhood stories, I learned that not all is hopeless. I saw that the work of the nurses and physicians at LCHC produces tangible results. I witnessed the overflowing love of God from people who were called to love the sick and preach the Kingdom of God. I realized that God desired to combat health disparities and bring justice to the poor. Their fruit is an inspiration for me to use my nursing education for the Lord and for his purposes in the world. Living among the urban poor helped me see the need for nurses who care about them -- and I am inspired to meet this need. Love this, Santine. Well done.